The small electric-assist motor attached to the front wheel of Chocosol’s orange, surprisingly sleek, front-end-loading cargo bike is the last of the many custom features mentioned by Mathieu McFadden Chocosol’s chief wholesale and market animator. He points out the “pedal assist” mechanism grudgingly. He doesn’t want anyone to think that adding a motor to a bike takes away from the authenticity of Chocosol’s commitment to cycling. Since starting 10 years ago in Oaxaca, Mexico, Chocosol has emerged into one of Toronto’s premier providers of artisanal chocolate. 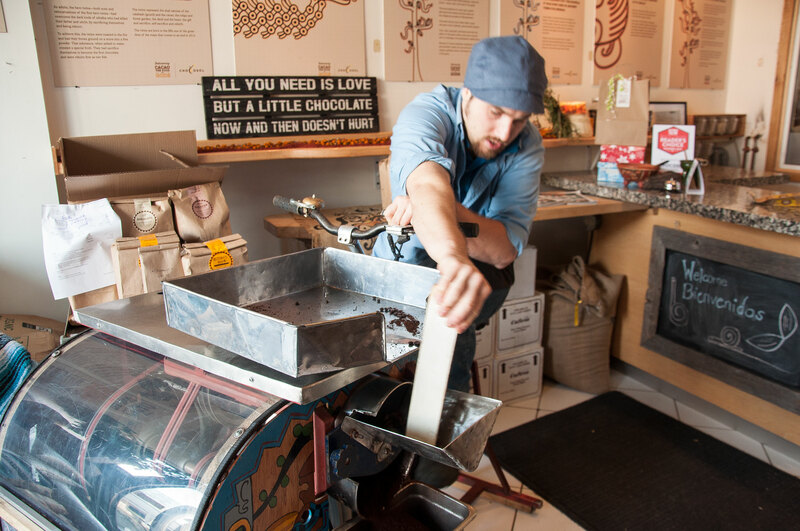 Their St. Clair Avenue West store at 1131 St. Clair Ave. West sells chocolate for eating and drinking, coffee, vanilla pods and more, mainly sourced from farmers in Mexico. Their products are vegan, and have no nuts, soy, gluten or preservatives. They also come in reusable and compostable packaging. Chocosol says their chocolate, “is a symbol that embodies our values of socially just, ecological chocolate.” It really is a guilt-free indulgence. The concern for authenticity, whether about bikes, or their products, is evident throughout their shop. Burlap bags of cacao beans line one wall, as if they had just arrived from Mexico. A bicycle grinder sits firmly planted in the middle of the store, ready for customers to grind their own coffee beans. A few staff members are visible through the kitchen door, including Michael Sacco, Chocosol’s founder, cleaning dishes. Behind the kitchen is a thorough waste management system that separates garbage into four categories. Outside the store McFadden continues to make the case for his pedal-assist motor. He says the cargo bike can carry five large bins in the front while towing a custom trailer, used to display their wares at markets and community events. All told, it can haul about 200 lbs worth of gear. McFadden says the small motor on the front wheel was a game changer. “We haven’t moved away from bicycle technology,” says McFadden, “but we’ve embraced the demand and the need to increase our production.” In addition to the big-haul cargo bike, they have two mountain bikes with Bionx motors and two trailers. 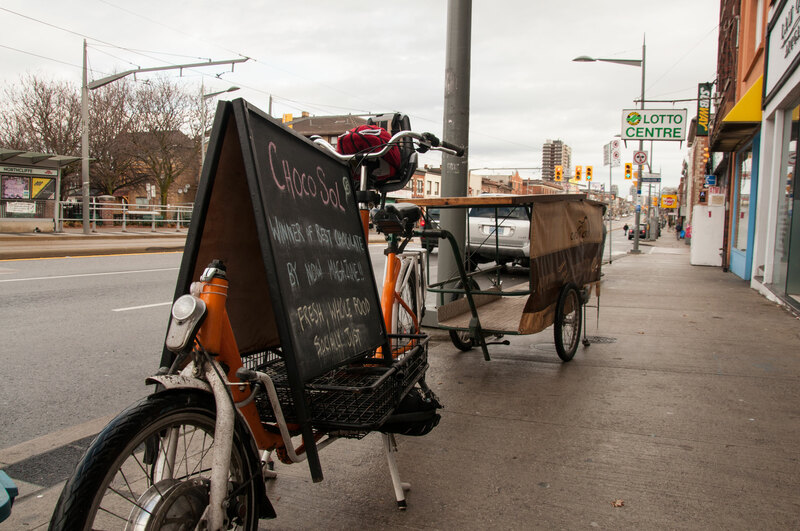 Whenever deliveries can be made by bike, Chocosol is ready to roll. Chocosol isn't just pushing what they can accomplish by bike, they are constantly looking to innovate their products and methods of production. In the garage at the back of the property roasted cacao beans are being mixed into new blends for their chocolate. 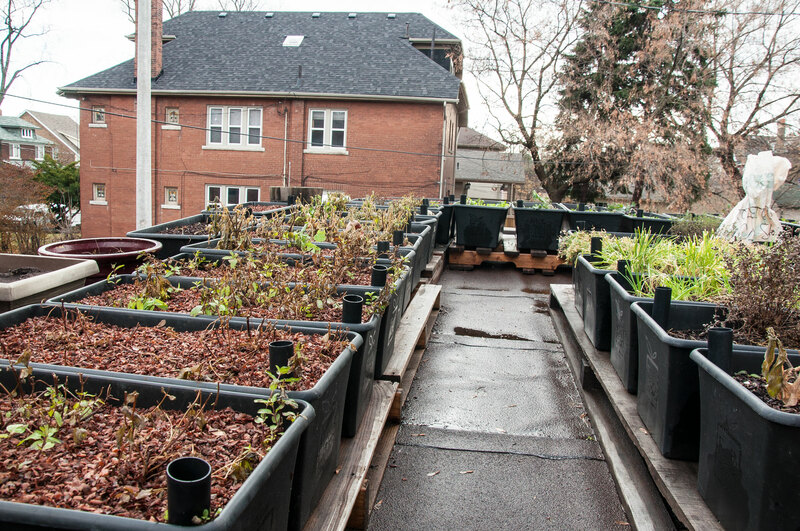 On top of that garage, an assortment of planters are arranged next to a water capture system so they can grow their own herbs and spices. A small second-floor kitchen has corn drying for tortillas and bins of worms breaking down various organic waste products for their ChocoSoil. That soil is made from organic waste Chocosol produces and is transformed by their vermicomposters. That compost is added to planters with nutrient-rich cacao shells that continue to break down. Chocosol is using this ChocoSoil to grow their herbs and spices for use in their chocolate. The many projects Chocosol has on the go and the drive to do things differently can largely be traced back to Sacco's early iteration of the bicycle grinder. After learning to use hand grinders to make chocolate through traditional Mexican methods, Sacco found himself spending up to 13 hours at a time grinding beans to meet demand. Sacco was also learning about welding at the time and began building a stationary bike to power a grinder and take some of the load off his arm. For many of the farmers Chocosol works with, the actual finished product from the bean they were growing was something they felt they could not make without access to an industrial facility. Chocolate, for many people, comes from a factory and there is a disconnect between the people growing the cacao and the bar you pick up in a store. McFadden says the bicycle grinder is a simple tool that allows cacao growers to take on small-scale production themselves. “Bicycle power tools are amazing because anywhere on the planet you can find bicycle parts, you can service bicycle tools,” McFadden says. “The bicycle grinder is also socially engaging,” says McFadden. 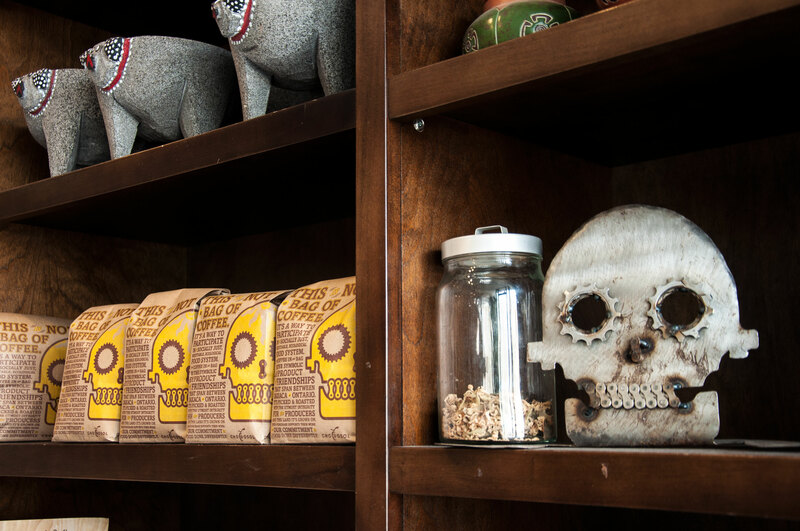 The grinder largely stays at the store so customers can grind their coffee beans and blended drinks can be made at in-house events. It’s a rustically beautiful machine, built by Chocosol in collaboration with artist Alberto De Cicbio (who also helped design and build Chocosol's cargo bike). It has a gear and grinding system housed in a painted, windowed box where a basket might go.